Mills explained their inspiration: "Statistically, it seems like in our community we are incarcerated or doing nothing. We want to go against the grain and not be another statistic, and we wanted to inspire other people to do the same." Hall added, "We want to show that people who look like us can be doing something positive." The run was definitely inspirational for many. The two guys (who don't really consider themselves runners) made the 20 day trip through all sorts of climates with the backing of thousands of people on social media. They gained momentum by reading the inspirational messages from supporters daily. Upon arriving at the memorial for Michael Brown, the fellas became emotional as they were greeted by more supporters there to salute their effort and remember the cause at hand. When asked about the overall hope for their mission Hall explained-"The purpose of this was never forget, but to keep raising awareness of what's going on around us, so this is not the end. We will still run, not necessarily 540 miles, but we will still run." I have to salute these brothers for the work that they put in to pull this off. A small amount of training, and a huge amount of dedication has landed them a platform to speak on a very important cause. 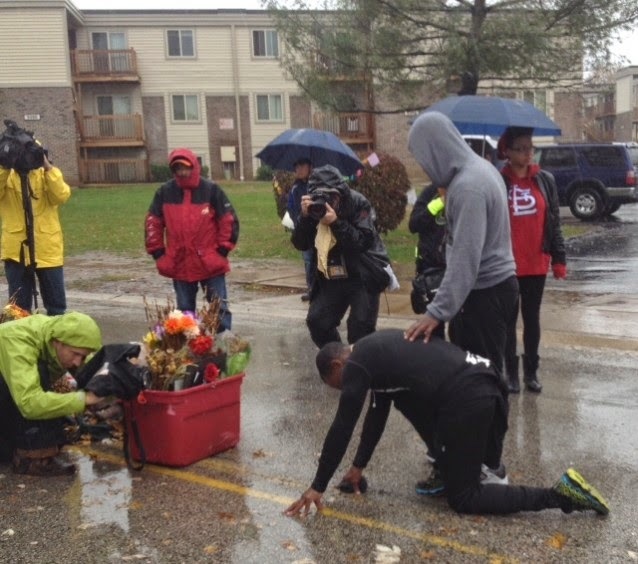 See their emotional arrival in Ferguson below, and follow up with their efforts on therunforjustice.org!